I am not a neat freak in most areas, but I have anxiety about Andrew's bottles, cups, etc. being clean enough or the just-cleaned items touching my (imaginedly filthy) plastic and metal dish drying rack. 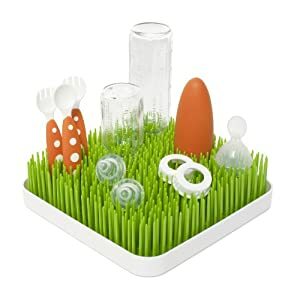 Enter Boon's Grass Drying Rack to save the day--while this ingenious product has been out for a while now, I just got one and love, love, LOVE it. All this drying rack is is a bunch of green plastic blades of "grass" sticking up from a white plastic tray. Simple in theory, but amazing in function. Unlike traditional racks, everything fits nice and snugly onto the slightly flexible blades so that there is little danger of you knocking just-cleaned items onto the floor (almost as terrible as spilling breast milk, no?) And everything is just a little suspended above the plastic tray so that nothing is sitting in water (yuck). Plus, the entire square rack of blades slips easily in and out of the drip tray for easy cleaning. This rack is for sale for around $14.99 at both Amazon and Babies R Us (and surely at other retailers as well.) If you're sick of dealing with other complicated, messy, or just plain annoying bottle racks, this is the answer to your prayers! It seems like the perfect drying rack for any mom with infants or toddlers around. Children will surely grow fond of it too.